"Dear Kerns, What a delicious surprise! Thank you so much and also for the recipe. I'm looking forward to trying it. My Family and friends have admired my new floor and I'm sure, will mention it to others, at the moment I can't offer a referral, but I'll keep the card handy. It was a pleasure having you do one of my rooms. Workmanship was excellent and quickly done. Thanks again." "Psychologically it’s not easy to have strangers invade one’s personal space. I have to say your crews did a fine job at respecting that. Also, your ability to accept a little jocularity helped to relieve tensions I had with such a big undertaking. I appreciated your professionalism, knowledge of products, courtesy and kindness throughout the whole process. You were there every step of the way. I must say, I've never received this type of care and concern any other time I've made a large purchase or hired work done. Kerns' slogan truly lives up to its' name!" In a world that criticizes and complains more often than it complements - we felt necessary to send a personal note of 'thanks' to you, (beyond that survey we completed and returned). My wife Kathy and I had no idea where to shop and purchase new carpeting. We had a bad experience with a company some time ago, and were somewhat cautious this time around. We contacted friends Jan and Ken Witt from Waterford, who recently had carpet installed. They highly recommended Kerns in Greenfield and had a great experience there. With a large living room/dining room and two bedrooms to be done, we trusted them and went to the Kerns - Greenfield location as we live in East Troy. This was the BEST decision we could have made! Wayne Bock welcomed us and gave us many options and color choices, and then left us alone to decide and talk. Enter Debra Nowak, who together with Wayne - helped us refine choices and costs. We indicated that we purchased all new furniture from BILTRIGHT Furniture, just blocks east on Layton. Unsure on which carpet would match the new furniture, your brilliant staff gave us numerous sample boards and sent us down to the furniture store to match them up! We actually changed our minds after matching the swamples with the furniture. Your Kerns team and family committed to quality and excellence overwhelmed us. Upon purchase with Debra, we were soon contacted for measurement by (cannot remember his name), who measured all of the weird angels and octagon arrangements, and we were called soon after regarding carpet arrival, installation dates and arrangements. Everything was on time and precise. The installers Dan and Larry were fabulous. They advised, assisted, worked with our awkward three open large areas, with all of our furniture in the kitchen, bath, etc. And their advisement to 'roll or tuft over' the carpet meet the wood floor in various areas vs. the brass hardware was a great choice. They cleaned, advised and insisted that we inspect and add or ask for anything else before leaving. WOW! Though the installation is the last part of the great job Kerns does, for us it was the reason we were nervous in the first place - great carpet, bad installation. Not here. The precision, quality, customer satisfaction and caring on all levels has brought us to write this letter of acknowledgement. Every step was coordinated on time and communicated brilliantly. As you can see, we are very pleased with the Kerns experience and will recommend the 'Kerns Way' to others, and will be ongoing testimonials for friends and many connections we have. 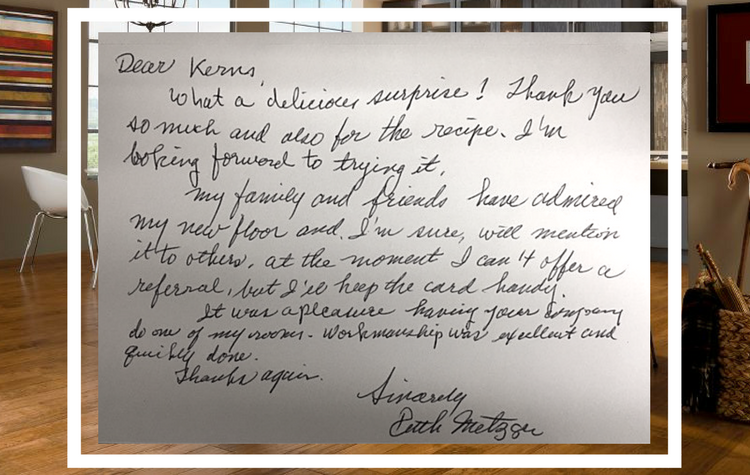 Best regards, Jim and Kathy M."
"Thank you for giving me the chance to tell you about my experience with the new carpet I had installed by Kerns yesterday. First of all, last year at the NARI Home Improvement Show I stopped by your booth to discuss new carpeting and was very impressed with your representative, although not quite financially ready to do the job yet. This year, now being ready, I made it a point to again attend the show again and seek out your booth. Although I did stop at several other booths to discuss carpeting, Rob from your Greenfield store was very impressive, both professionally and personally, and I felt Kerns was right for me. Rob suggested I have measurements done first, so I would not be disappointed by picking out carpeting and later realizing it may be out of my price range. I though that was AWESOME idea! We set it up, and Randy came a few days later for the measurements. He too was very professional and helpful, giving me some great suggestions about the seam placements. Within a couple of days I was in the store to pick out the carpeting with Rob. He was extremely helpful with suggestions for my needs and budget. I took some samples home and came back the following day to order the carpet and set up a day for installation. Yesterday Bob and John showed up within the scheduled time-frame, which was greatly appreciated. They were very helpful and careful with moving some of the bigger pieces of furniture. Throughout the installation they were very professional, pleasant, informative and gracious with explanations and answers to any questions I had. I was pleased at how quick and efficient they were, and extremely impressed by their experience and ability to figure out some little problems that arose. I was also grateful that they stayed to make sure I was able to get my cable, phone and computer system hooked back appropriately, as this was a great source of anxiety for me! Now, the day after, I absolutely love the carpet. The quality is wonderful, and the whole process from start to finish was a very satisfying experience. It's amazing how something as simple (or not) as replacing carpeting can be so stressful, but Kerns and all of it's employees made is so much easier, and for that I am very thankful. I also plan to use Kerns for my future carpet cleaning, so I thank your for the coupon. I would absolutely recommend Kerns to anyone who has flooring needs. "We just had to tell you that Dan and Larry were here to stretch the carpet which had a wrinkle problem caused by the carpet cleaner last April. Dan and Larry were on time, polite, efficient beyond our hopes and did a splendid job. They speak well for Kerns Carpets and you can be proud of them. Thank you for the fine service! "I said I'd be back, so here I am. After our initial good experience with a carpet install, we decided to have a wood grained look wide board laminate installed in our family room. This was not an easy job, as we wanted it laid over existing tile that we did not want damaged. [The installer], came to my home ahead of time to see if he thought he could do it. He assured me he could and also gave me the feeling of confidence in the job we were to have done. [The manager] of the Fox Point location, explained to us what were dealing with in great detail, but with the confidence I had in [the installer], we decided to go ahead and have the installation. On the day of the install, [the installation crew] showed up early and started right to work. They were professional and efficient and the end product looks wonderful. Around the fireplace hearth they scribed the laminate instead of framing it and the result is absolutely outstanding. Needless to say, if we need additional flooring in the future, we will be going to Kern's. Great job from inquiry to completion. [The manager] even stopped by to see how everything was going and called the next day to make sure we were pleased. Again,... we are very pleased. Steve E. - Brown Deer, WI. "Our tile installers Shawn & Aaron were meticulous in their work and displayed a high level of expertise. We are totally thrilled. Debra Nowak was professional and caring and made us comfortable throughout the entire process. "Installers were great! Very professional and returned furniture correctly to both rooms. Also Allan Kopp is a great sales person to work with. "I want you to know that we had a lower bid from Home Depot ($300) and we went with Kerns because of our past experiences which you have been great!" "Our carpet installers Bob & John were quick, efficient and were professional. We were completely happy with the installation. Debra Nowak went above and beyond in assisting us in our carpet selection." "Debra was so patient and helpful. I would highly recommend her to everyone. Thank you! I'm very happy with the new carpet." "Debora did a great job pointing out products, their features, differences, etc. Wayne did an excellent job of installing our flooring to our satisfaction. Very professional on all fronts." "We were very pleased with the courtesy and workmanship from Howard and the installers. This is our 2nd project with Kerns and would use for any future projects." "We had the carpet replaced in a spare bedroom> the ordering process was easy> when carpet was received at store they arranged an installation time in a timely manner> the installers, Kevin and Ian, were actually early on the day of installation, were friendly, performed excellent work, and were very professional, and quick in their duties> we are very pleased with the job and the carpet and would recommend them highly. Kevin, the manager, makes the process a pleasure, and gives you the sense that he truely cares about your satisfaction. we are so pleased, in fact, that we are having another room done..."
"We would like to thank you for the service and quality that all of you stand for. We purchased a laminate floor (Jerusalem Stone) in July of 2003. I liked the flooring, however, it developed black on most of the seams. Since, I am a teacher many things are put off to the summer. I contacted Kerns after the first summer suggestions were made as to what I could use to get rid of the marks, nothing worked. After dealing with it longer and with no success to remove the marks I contacted Kerns again. Wally came out to the house to look at it himself. His comment was 'I have never seen this that', He contacted the service representatives and within days I received a letter from Mannington with directions on how to file the claim. Mannington contacted me within a very short time telling me to schedule the installation of the new floor. "We have been customers of Kerns for a long time and will continue to be. In fact we are in our home for 24 years and still have some of our original carpeting. We appreciate the quality of your products and the concern for your customers. You do live up to your advertisement, 'if you shop at Kerns you will have no concerns'. Thank you." Jim and Janine - WI. "Thanks for your help & service to me in 2011. You go the extra mile to please clients." "The 2 men who installed carpeting were EXCELLENT!!" "Erin was willing to visit our home & had great suggestions." Jim - Menomonee Falls, WI. "Dan and Larry did a fantastic job. Thanks, the carpeting is wonderful." "We have enjoyed the wonderful service from Kerns previously and highly recommend Kerns to our friends. Thank you!!" Mr. & Mrs. McG - Wauwatosa, WI. "Top notch HEAD TO TOE." "Installers were very professional, very quiet & had a great sense of humor. Made the process a lot easier & less stressful for me which was appreciated in more ways than anyone would really understand. Tell them THANKS!!" "Dan did a excellent job." Ms. Bryant - Milwaukee, WI. "We are very happy with out experience and will definitely recommend Kerns." "The guys worked so hard and did a great job." Ms. Wegner - Milwaukee, WI. "Very impressed with both the work ethic, professionalism and their installation skill. The job far exceeded my expectations." Shirley - Brown Deer, WI. We love you all too!!! <3 Kerns! Customer: Joe B. said "Thank you! Love our carpeting!!" Customer: Ruth Z. said "I did not hesitate to shop at Kern's when I needed new carpeting. Shannon was very helpful and pleasant to deal with. The two installers did a great job. The carpeting looks great." Customer: Joe B. said "Love your company and we recommend you whenever possible!" Customer: Pat R. said "Kudos to everyone at Kern's. Great job!" Customer: Larry D. said "Great experience." Customer: Mary J. said "The installers were both very nice and very polite. They worked in an efficient manner and cleaned up after themselves very nicely." Customer: John K. said "We have purchased carpet and hardwood from Howard many times. He is great!! Dan and Larry, the installers, were very nice and professional!" Customer: Florence P. said "Want to thank you for the help in getting my floors done in such a short moment of time before my surgery. It is beautiful. What a change in my home and the gentlemen that did the installation was fantastic. It all went smoothly. The house, floors is just excellent. Again thank you." Customer said "The installer was top notch. This is my second purchase from Kern's (Fox Point) and both times have been Great! Thanks." Customer: Alan S. said"Installers Dan and Larry were excellent and I request them for my next installation. Howard is low key first rate and I will continue to use Kern's because of him." Customer: Bonnie H. said "A pleasure doing business with Howard and Dave. They did a great job on the installation." Howard- always professional and Courteous. + Tim and Kevin-nice, polite, quick,great guys. A very positive experience and the carpet looks and feels great. The service, staff, and product has always been the best. That's why we always come back to Kerns Carpet One. A special thanks to Alan Kopp for all his help. He's #1. Very polite, answered all questions. Debra in Brown Deer said: "Store is wonderful. Did a great job helping us pick just the right product. Installers also did a great job - they were amazingly fast and did a very nice job. Thanks!!!" Installer was awesome! Efficient, hard working, friendly, good attitude toward a LONG day of work. I bought an Arm Strong composite and couldn't be more please. Everyone was helpful and the final product looks great! Hi! Just wanted to let you know that everything about the runner installation was great. The installers were wonderful (even gave the breezeway they came through a quick vacuum! Amazing.) The carpet looks terrific...All in all it was a excellent experience. So happy and excited. Thanks to Kerns for your flexibility and willingness to work around my schedule. Thank you Joe, Judy, Bob and John. I have no concerns. I shopped at Kerns! And I'm thrilled! We shopped here (Kerns Carpets) for years and have always been satisfied. This was a replacement floor due to water damage. Our Insurance Company works with Kerns. Dennis Werner contacted us. Very pleased with the entire process. Not only was he informative but extremely helpful on the entire process from start to finish. Outstanding job by the two guys who installed the floor! Excellent work! Very happy with carpet and installation. Installer was courteous and professional. Appreciate the quick turn around time. Normally I do not take the time to fill out surveys - however, my experience was so good, I wanted to! Installer was great (better than the one we had the last time) zero scuffs or repair work. Christine is also fantastic to work with. Great experience! Fast service, would highly recommend to friends and family. We were very impressed with our installers Sean and Eric. They were polite, professional and very knowledgeable and efficient. All 3 installers did a great job! Kerns was great - installers were terrific. We need more carpet and hope Bob and John will be the installers! it was a pleasure dealing with Howard! Thank you.